If you’re a vendor at the show, leave a comment below with your booth # and info. I’d love to meet you. And if you plan on attending the show, I’d love to meet you too! Leave a comment here, and let me know where you’ll be at the show! Brian make sure and stop by booth #230 and visit the with the whole Z and Z crew! We will be sporting our new hair cuts. The whole crew except my wife Tina had mohawks shaved on their ugly skulls. Zack has been sporting the long skater hair for years. We have tried to get him to let us shave it into a hawk a couple of times. He always said “no way”! Turns out all he needed was a little incentive. Danny Cash’s offer of a paint ball gun and the assurance that everyone else would do it was all he needed! See you at the Show and thanks for the “heads” up! Ha.. I crack myself up. Calll me if you need a pass to get in, and not wait in line. 425-785-1289. Great way to promote the show! 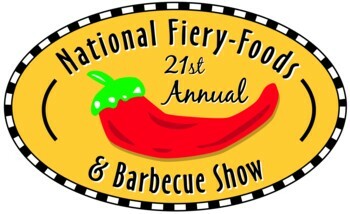 Please stop by the Melanie’s Fine Foods Booth 211 to taste our Big Acres Milagro Mole, mango peach chile sauce, Stellar Steak Rub and all our other Scovie winners too. Al, I can not tell you how much I am sorry you can’t come along, and am going to miss you at the show. If I was a rich man, I’d take you along. Is there anything I can get for you at the show? Let me know. @Sam – can’t wait to meet Zack and Zane at the show! See you there. Thanks Brian, I am all good, you just go and have a ball, and I am sure I will see you before you know it. Brian, pull the hand in warm water gag on Ed! Yeah, we’ll be in our regular spot by Captain Thom and Simmie J’s at booth #306. It should be pretty easy to find, especially with a geiger counter.